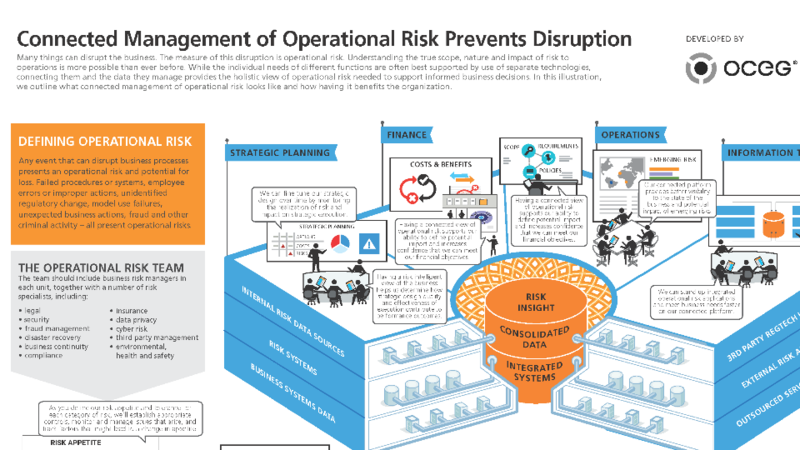 In this illustration we outline what a connected view of operational risk looks like and how having it benefits the organization. Many things can disrupt the business. The measure of this disruption is operational risk. Understanding the true scope, nature and impact of risk to operations is more possible today than ever before. While the individual needs of different functions are often best supported by use of separate technologies, it is essential to harmonize and connect them, and the data they manage, to gain the holistic view of operational risk needed to support informed business decisions. We have emailed instructions to access Operational Risk Management to . Make sure the email arrives in your inbox: either add "support@oceg.org" as a safe sender to your email platform, or if you use Gmail, drag our email into your Primary tab.